Nursery School Uniforms… and Upwards! Across Cumbria and the North of England, very small people will be coming to the end of their family holidays and heading for child-minders, nurseries and primary schools in the next few weeks, many of them for the first time. 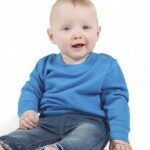 At Stitch & Print, we’re known for our workwear – and part of that involves providing school uniform for a range of schools, Nurseries and childminders. But school doesn’t start at four years old; We also do the smallest of sizes in polo shirts, sweatshirts and fleeces for youngsters. 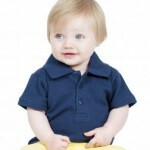 Starting at sizes suitable for just 6 months old and with over 20 colours on offer, you can be sure of the colour fastness and quality of our polo shirts and parents can relax about what their children should wear for a busy day of play. We also offer printed T-shirts for something even less formal – ideal for trips out and about or for group photographs to mark the start of school life. We’re very competitive on our full range of both staff & pupil uniform, whether it’s for a large school, a bustling nursery or a small child minding business & all of our uniform prices includes embroidery. “We’ve worked on 500 pieces for schools in Carlisle, 20 pieces for a nursery in Weymouth & done a single polo shirt for a start-up child-minding business in Cockermouth, in the last year and they were very pleased with the results and service on the different order sizes we offer,” says Richard. So, if you’re considering creating a school uniform for your nursery or child-minding business don’t be put off by thinking it’s only for large school, We have a minimum quantity of a single piece of embroidered school uniform! If you could use some advice on the costs and options available, please get in touch. We’d be happy to put together some ideas to give you what you need. This entry was posted in School Uniform and tagged Cumbria, embroidered, nursery, school trip, schools, toddler, uniform on 3rd September 2015 by admin.